The LFO – Low Frequency Oscillator – is one of the most fundamental of electronic music elements. Creating a signal that modulates the sound of something else, the LFO has a history that’s roughly as old as sound-making electronic circuits themselves. And yet, there’s still more that can be done with them. Two new LFOs blur the lines between analog and digital, hardware and software, and pack clever features into their interface and function. 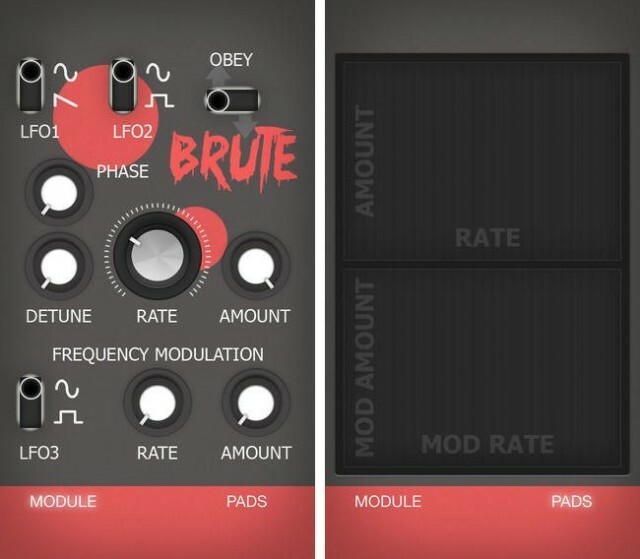 Justus Kandzi’s Brute LFO puts hardware modulation in the palm of your hand. Brute LFO runs on any iPhone, iPad, or iPod touch with iOS 6 or later. But it’s not a self-contained app: it comes alive when you connect your phone or tablet to external analog hardware. Route the audio from the headphone jack on one of those devices into a control voltage input – which now includes a growing range of inexpensive gear – and you can use your iThing as a modular signal source. It can shape pitch, the filter, or any other parameter with CV input. It consists of three separate LFOs. LFO 1 and 2 can be controlled using the control elements in the top half of the screen. The big knob in he middle sets the rate of both the LFOs. Additionally you can change the waveforms of the LFOs, detune LFO 2 and change its phase. The amount knob in the top half also sets the overall amount of the modulation. The elements on the bottom half (LFO 3) can be used to modulate the frequency of LFO 1 and 2. And the brute switch destroys everything! If Ableton Live is your preferred tool, there have been a variety of LFOs from which to choose – most recently, even one from Ableton themselves. Sadly, Ableton has never offered an integrated LFO source in the software, but Max for Live provides most of the features you’d want. Your only challenge was picking which one. 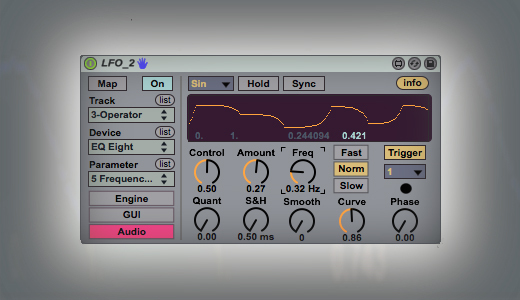 Maestro Robert Henke, the absurdly-prolific musician and engineer who helped found Ableton, has created an LFO that might make that choice a lot easier. LFO 2.0 will work with your software. You can directly integrate it with Live’s engine – there’s no modulation control, but that keeps everything fast. Or you can set it to graphical control via the on-screen knobs. You can also use LFO 2.0 with analog hardware. Ideally, you’ll want an audio interface like MOTU’s excellent offerings that include a DC coupling. (MOTU, themselves, offered a similar product in Volta.) Robert says he’s using his with Arturia’s MicroBrute (cough, ahem, CDM review coming very soon on that), and the MOTU UltraLite, which remains one of my favorite interfaces for its bang-to-buck ratio, usability, and sound. Waveforms: Sine, Ramp Up, Ramp Down, Square, Stepped Random, Smooth Random, and Binary Random. Modulation for the LFO output: Quant adds steps, Sample & Hold samples in regular intervals, Sync uses beat time intervals, Smooth and Curve create symmetrical and asymmetrical modulation, respectively. In other words, what looks on the surface like Just Another LFO in fact has some Robert Henke Twists (TM) that can produce some unique results – once you get creative with those knobs. And you can add this to your library o’ Robert Henke Max for Live plug-ins. It’s a fascinating relationship to have with artists. Whereas once you might get lessons with a composer, or study scores, now you can study plug-ins. And just like the lessons and scores, you can take what you learn and bend it to your own unique desires and personality. So, while you’re telling Robert what you’re making, do tell us, too. Modular patching with Expert Sleepers Silent Way and ES-3 from Andrew Ostler on Vimeo. If you start to get addicted to computer modulation of gear, you will absolutely want to look at using an audio interface suited for the job – and you may find yourself feeding your addiction with other software. UK developer Expert Sleepers has you covered on both counts. Now, combining that with Robert’s LFO I think makes some sense. The Silent Way stuff works perfectly in Ableton. LFO 2.0 then becomes an easy-to-access LFO that’s simpler than the Expert Way one that can swap between internal and external control. You can get a demo to test your gear before you spend the (paltry) US$59 to buy the software. Have fun out there, folks.